My new book with Ellen Stofan, Planetology: Unlocking the Secrets of the Solar System, will debut in stores on November 18. It’s already available for order online. 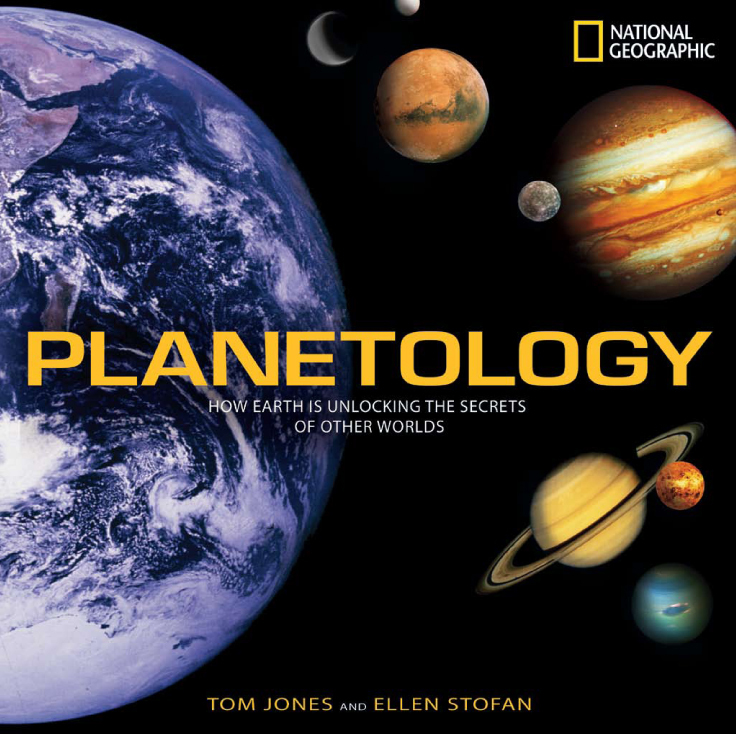 WASHINGTON (Sept. 22, 2008)—Veteran astronaut and planetary scientist Tom Jones and noted planetary geologist Ellen Stofan join forces and use the latest space technology to reveal astonishing new insights into the dynamic stories of Earth and its celestial neighbors. PLANETOLOGY: UNLOCKING THE SECRETS OF THE SOLAR SYSTEM (National Geographic Books, ISBN: 978-1-4262-0121-9, Nov. 18, 2008, $35 hardcover) presents compelling new images of Earth—many captured by space shuttle and space station crew members—and remarkable scenes of alien surfaces beamed home by our far-ranging robotic probes, from the international fleet of spacecraft on and around Mars to the Cassini Saturn mission. These striking images, viewed side by side, show us the powerful forces that have shaped our own planet, and inform humanity’s age-old quest for other worlds like our own. PLANETOLOGY contains remarkable visual evidence of the natural processes that have shaped the varied planetary landscapes in our solar system: searing lava plains, windswept deserts, active volcanoes, jagged mountains, majestic glaciers and stark impact craters. Readers discover the details behind the solar system’s largest volcano, Mars’ “dry ice” polar caps, and the on-going threat of comet and asteroid collisions with Earth. A comprehensive new portrait of the solar system unfolds in PLANETOLOGY. The authors bring a fresh approach to the study of space science and illustrate clearly how discovery of dramatic features of other planets give us crucial information about our own. Engaging text, highlighted with personal experiences from space flights and robotic exploratory missions, make this book just as absorbing as it is informative. Tom Jones is a planetary scientist, author, pilot and veteran NASA astronaut. He flew on four space shuttle missions and led three space walks to help his crew install the centerpiece of the International Space Station. He has written “Hell Hawks!,” “Sky Walking: An Astronaut’s Memoir” and “The Complete Idiot’s Guide to NASA.” Ellen Stofan is a planetary geologist who has studied volcanic and tectonic features on Venus, Mars, Titan, and Earth. While at NASA, she was Chief Scientist on the New Millennium Program and is currently Senior Research Scientist at Proxemy Research, and Honorary Professor of Earth Sciences at University College London. Ellen Stofan and I have our preview copies in hand, and the book is spectacular. We hope you’ll grab a copy in time for Christmas. Planetology will be a perfect gift for anyone with an interest in our place in the solar system and universe.